The Aero A.42 was a Czechoslovakian bomber aircraft of 1929 that was only ever produced in prototype form. For its day, it was an advanced design, with a sleek monoplane configuration. However, the Czech Air Force was not satisfied with it for a number of reasons, in particular, the aircraft's take-off and landing rolls were felt to be excessively long, and crew complained about the cramped cabin. The air force suggested a set of modifications to Aero, including replacing the wooden wing with a metal one, but Aero discontinued development. On September 20, 1930, one of the two prototypes set international speed records of 253.428 km/h over a 1,000 km (621 mile) closed circuit, carrying payloads of 500 kg (1,100 lb) and 1000 kg (2,200 lb). 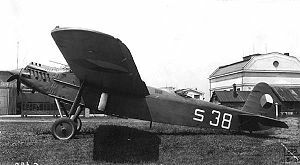 One prototype was used by the Czechoslovak Air Force until 1938, then by the Slovak Air Force. Probably it was scrapped in 1940. The A.42 was a single-engined high-wing cantilever monoplane, with a fixed landing gear.